The Bluff is a little late this week. I just watched the first edit of my Stand Up DVD. It’s looking shinier than Andy Harper’s head. It’ll be released mid-year. Another mid year release is the all new brand-spanking competition the FFA Cup! It’s a chance for all the semi-professional clubs within Australia to win on the big stage. It’ll work like the FA Cup in England. For those unfamiliar – the FA Cup is a knockout competition open to all the clubs in England, culminating in the FA Cup Final in May, marking the end of the football season. The smaller clubs begin their journeys in August and the bigger clubs start their matches in January. Confused? Understandable. It has more by-laws than parking in the Melbourne City Council. It’s best not to try and understand it, just enjoy it. The real entertainment will come when we get David v Goliath battles like Northcote City v Western Sydney Wanderers. The Wanderers will smash them of course but by sheer law of averages we should see at least one major upset per year. That’ll be the fun part. Unless your team is the one that loses. Then that’ll be the ball shatteringly fucked part. David v Goliath happened yesterday when should-be relegated Melbourne Heart upset should-be promoted Brisbane Roar 1-0. Heart have only lost one match in 2014 whereas Brisbane, who were champions elect a month ago now look positively shaky. Is it all being set-up for Heart’s cross town rivals Victory to steal an unlikely come-from-behind Premier’s Plate? Yes. Because Victory are still managed by their work experience coach. ***To understand that joke please read about Ellyse Perry here. It’s not your fault, it’s the sexist sports coverage here in Australia. Finally in England – all four clubs that could still win the league: Chelsea, Arsenal, Man City & Liverpool – won on the weekend. So nothing really of interest. None of them even play each other til March 22nd: Chelsea v Arsenal. So until then we can only hope one will choke against a smaller team. It was FA Cup weekend in England so only a sixteen teams played but it included some big familiar names. Arsenal got a small amount of revenge on Liverpool defeating them 2-1 at Emirates Stadium. Manchester City knocked out fellow cash cow Chelsea, proving that Arabian oil is stronger than Russian gas. The interesting thing is we could have a Steel City Derby in the quarter finals. Sheffield United will play the winner of Charlton Athletic vs Sheffield Wednesday. This blogger doesn’t know any Sheffield fans of either team but my research has shown me that a famous Sheffield United supporter is Sean Bean, which means somehow they must be the villains of the piece. Go Wednesday! Melbourne Heart continued their run of great form, recording their highest ever win, thumping Wellington Phoenix 5-0! David Williams scored a hat trick, which is another first for Heart. The A-League’s cashed up underdogs have won four of their last five matches which has seen them climb up the ladder to… remain in last place. They could leapfrog Perth if they defeat ladder leaders Brisbane next Sunday. But that’s highly unlikely. The logic clearly being the more we look like Brazil the more chance we will play like them. Or perhaps we’re hoping short sighted football fans will watch us thinking we’re Brazil so we get more ratings? Who knows? I know I’m not a fan of a collar on a football strip. Unless we play one match with ties, then thats fine. This Wednesday Barcelona v Manchester City promises to be a very entertaining match. Cashed up English vs The soul of Catalonia. Is it enough for me to get up at 6.30am to watch? Hell no, I’ve got a baby coming in two months, I need all the sleep I can get. I’ll tape it and watch when I get up. What are you mental? Goal of the week – from Saturday night’s Asian Champions League. Despite this amazing goal Melbourne Victory won! Now could Ben Williams have a soft spot for Western Sydney Wanderers, considering he was born and bred in the region. [Sure, Canberra is a few hours away but geographically closer to Wanderers than anyone else] Does the FFA want the Wanderers to win the league because they’re the fairytale of the competition? Or more importantly does the FFA want to increase the value of the Wanderers because a consortium is making a bid for them soon? The other big matches of the week were less interesting. Liverpool thrashed Everton in the derby. Juventus easily dealt with Inter Milan. Oh and I have a new theory regarding Manchester United – they’re trying to lose to every team in the Premier League with the colour red. Stoke, Liverpool, Sunderland have all had a turn, meaning Arsenal, Southampton and Crystal Palace shall taste victory soon. Brisbane Roar continued their canter towards winning the A-League by coming from behind to beat Central Coast Mariners yesterday. 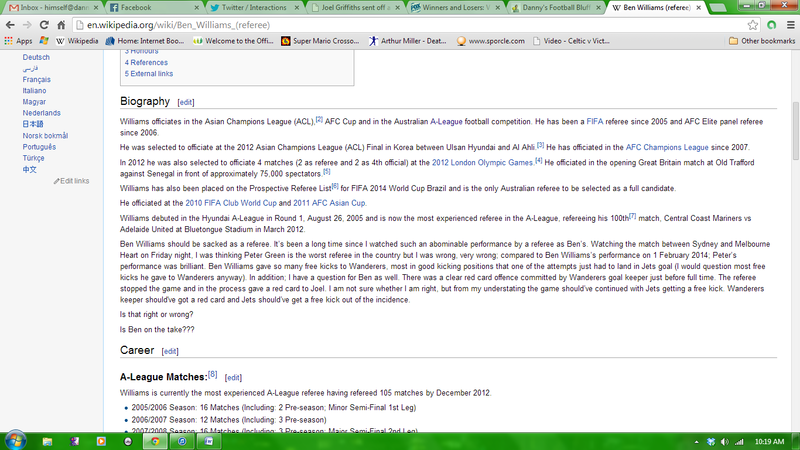 On the Fox Sports website there is an article claiming Roar attacker Thomas Broich is the best player in the A-League. Meaning Melbourne Victory will be making an offer for him in the next 24 hours. Tomorrow morning Australia time Manchester v Chelsea kicks off at 7am. The league will probably go to one of these overly cashed up soul less teams so enjoy the spectacle!